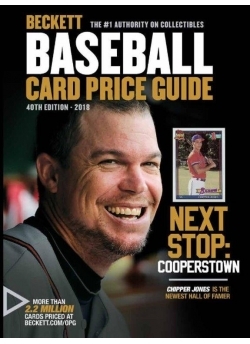 Complete checklists and pricing for every important and heavily traded baseball card set from 1909 through late 2017. Set description includes distinguished features, key cards, distribution information – everything you need to become a baseball expert. More than 800,000 cards priced in this edition. Minor League section covering most products released from 2002 to the present. Copyright © 2019, Beckett Collectibles Inc., All rights reserved.